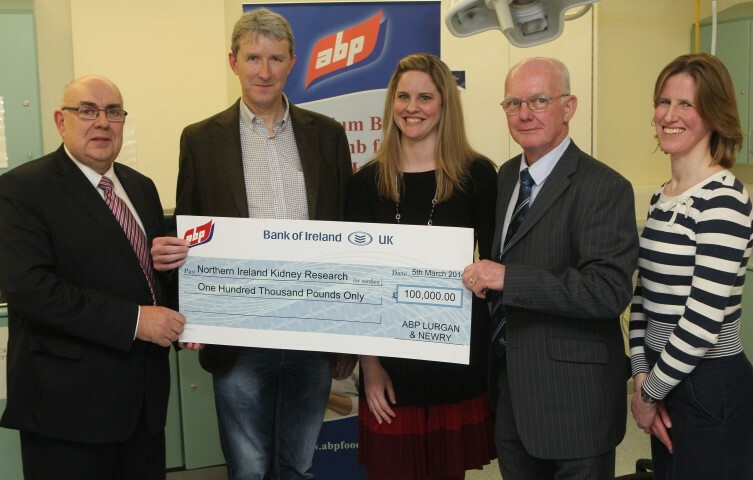 A cheque for £100,000 was presented to the Northern Ireland Kidney Research Fund in the Renal Unit of Belfast City Hospital by the ABP Food Group yesterday. 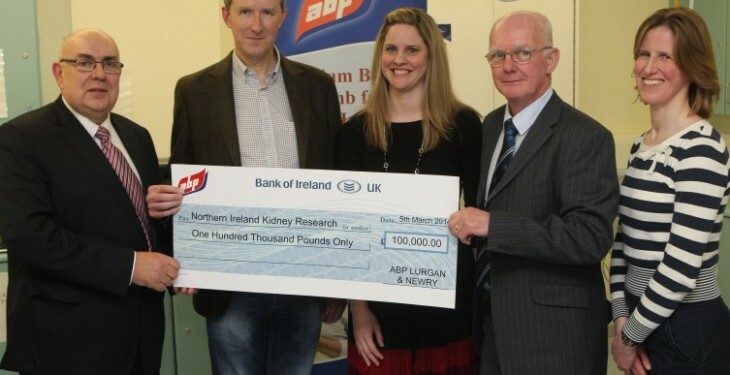 This follows a Charity Gala Ball held in November, organised by ABP in Northern Ireland, after the manager at the ABP Lurgan plant, Seamus Kenny received a successful kidney transplant. Both Seamus and his wife Pauline, who donated one of her kidneys, underwent surgery at Belfast City Hospital last year. The unique aspect of this kidney transplant story is that Pauline was not a compatible donor for Seamus. However, the couple were accepted onto a paired exchange programme whereby Pauline donated her kidney to a compatible patient while Seamus received a kidney from another willing donor. The paired system sees willing donors and recipients swap kidneys so their loved ones can benefit. £60,000 was raised at the Charity Gala Ball for the Northern Ireland Kidney Research Fund and this was supplemented by a further £40,000 raised after the event. Yesterday, Seamus and Pauline Kenny were among a number of attendees shown around the Nephrology Research Laboratory and the Transplant and Dialysis Units. Professor Peter Maxwell gave a short presentation on the research into kidney disease being carried out at Belfast City Hospital and how the money will be spent. Image: Pictured at Belfast City Hospital are ABP’s Liam McCarthy; Seamus Kenny, kidney recipient and plant manager at ABP Lurgan; Dr. Jennifer Hanko, Consultant Nephrologist; John Brown of NIKRF; and Dr. Aisling Courtney, Consultant Nephrologist.